A few days ago, an overwhelming desire for Carbonara came over me. I needed that silky sauce like plant needed rain. In the middle of a drought. With enforced water restrictions. I don't know what made it burrow into my psyche, but it was so deep that I knew I wouldn't feel settled until I had a big plate of it. So, I set to work rummaging through the fridge and pantry. I had eggs and cheese. Oh, and even better, I had a package of Bucatini - my favorite noodle. There's something about that long, slender, hollow tube that I can't resist. I think it must be its ability to trap the sauce inside. I didn't have bacon, but I had prosciutto. That would work. 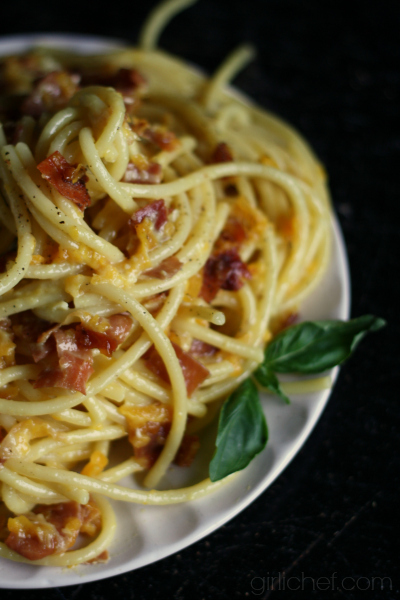 For a good Carbonara, that's really all you need. Maybe some black pepper to grind over the top. But, while I was rummaging, I found a good chunk of butternut squash. It was a third of one that I roasted to use for infusing vodka (more on that next week). I decided that while I'm in the throes of the 12 weeks of winter squash, I would add it to the dish. However, I did not want to wait for the oven to preheat and squash cubes to roast, so I thought I'd try grating it instead. The grated squash winds up just sort of melting into the sauce. Not literally, you can see the beautiful orange flecks in every twist and tangle, but the sweetness that you think might overpower the glory that is Carbornara, isn't present. So, why even both adding it? Why not!? Aside from being visually pleasing, it's always a bonus when I can add more vitamins and nutrients to my meals. It makes me feel good. Especially when the ground outside is frozen. The air outside is frozen. Actually, ever single thing outside is frozen. And my nose starts to tickle. I'm working hard to fend off the winter colds. I also have fresh basil growing in the house, thanks to my AeroGarden. Just a tiny smattering accentuated the pepper ground over the top. It was basically a plate of rich and creamy comfort...on a plate, in front of me...in less than 30 minutes. Consider my psyche untroubled once again. 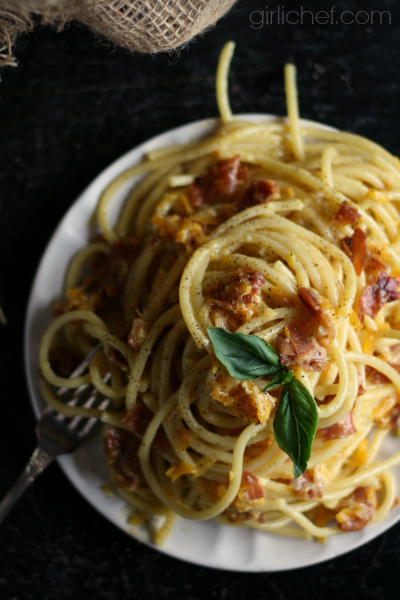 Creamy Carbonara sauce coats Bucatini pasta studded with prosciutto and flecks of orange butternut squash. Heat olive oil in a medium saucepan over medium heat. Add prosciutto ribbons and cook, stirring occasionally, until the prosciutto has crisped up, ~5 minutes. Add the grated squash and garlic and cook until soft, another 3-4 minutes. Remove from heat and set aside. Bring a pot of salted water to a boil (this can be started before you start everything else, but you do NOT want the pasta to be cooked until you have the other things ready). Add the Bucatini, and cook until al dente (according to package instructions). Drain the pasta, reserving 1/2 cup of the starchy cooking water. 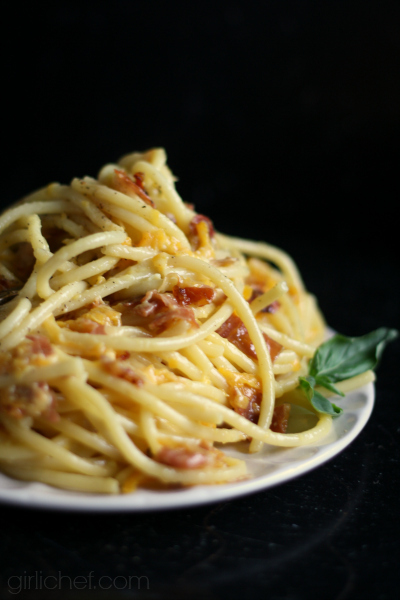 Immediately place the hot pasta back into the pan and pour the egg/cheese mixture over the top. 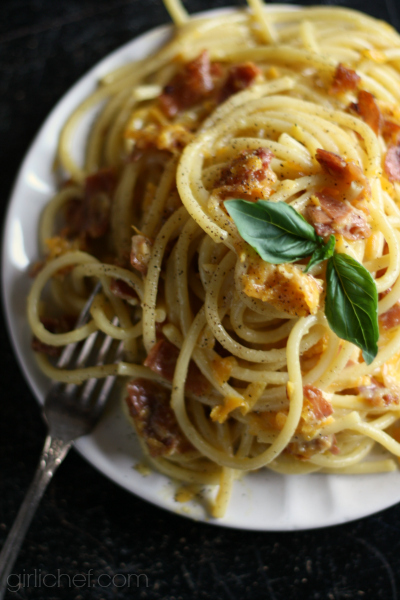 Toss pasta in the mixture using two large forks, until it has coated everything and turned into a creamy sauce. Toss in the reserved prosciutto/squash mixture. Thin the sauce a little, using the reserved pasta water, until it is smooth and creamy. Serve piled high on a plate with black pepper ground or cracked over the top, and a few fresh herbs (small sprigs or chopped), if you wish. Enjoy immediately. Join us for winter squash season! Joanne and I knew we wanted to celebrate winter squash for another 12 weeks this year. I'll just go ahead and say that it'll be a yearly tradition (that she's been doing for a few years now, and I joined in on last year). This year, we've got so many talented bloggers joining us in this celebration! We'd love it if you'd cook/bake along with us, too - there are 7 weeks left. We will be sharing a new winter squash dish every Monday, but you can feel free to link up a squash dish that you've made anytime during the week, as the linky tool will be open through the end of the day on Sunday. Or, if you're a blogger, and would like to post along with us on Mondays, just let one of us know so that we can add you to the group!